Lately, Friday night has become Pizza Night in our household. …Vegetarian Pizza Night, to be more accurate. I make the dough, sauces, and chop up all the toppings in the afternoon, let the dough rise for a few hours; and by the time Piyush and I are ready for dinner, all I have to do is toss it in the oven and wait for it to bake. I tend to make mostly vegetarian pizzas (there are some exceptions) because I don’t believe Piyush and I need to eat meat every single day. I also think vegetables are so vibrant and beautiful…meat would only ruin the beauty of the pizza. This week, I got the idea to use pistachios on our pizza. I thought the green would be pretty, and the flavor would be unique. As always, I used my typical whole wheat pizza crust recipe (you can check it out here). I did make one small change, though. Instead of normal whole wheat flour, I used Indian atta (chapati flour). Atta is also a whole wheat flour. I’m not entirely sure what the difference between atta and regular whole wheat flour is–I think it seems less course (although wikipedia says it should be more course). What I do know, is that atta makes the dough feel different and the result is a fabulously crunchy and thin crust! To give the pizza some nice garlic flavor, I made chili and garlic-infused olive oil; and brushed the crust with the oil before pre-baking the crust (I always bake my crust 5 minutes on a pizza stone at 450 degrees F before I put any toppings on. I think this helps keep the crust nice and crunchy). 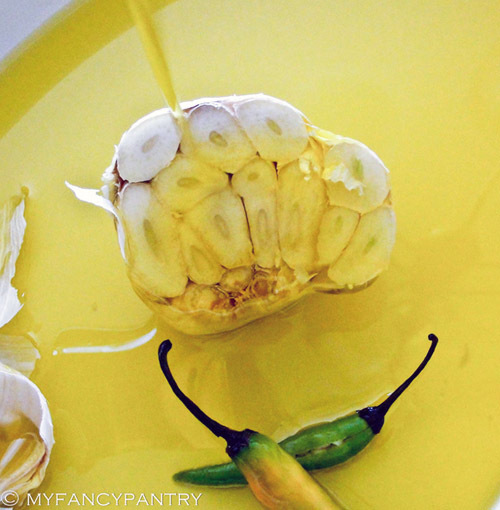 To make the oil, I simply took a small bottle of olive oil–no need to buy anything super expensive–and poured it over a couple heads of garlic that I had sliced in half and some chilies that I had made a few slits into. I tossed it in a oven that had been pre-heated to 300 degrees F and let the garlic and chilies roast for about an hour. Once it had roasted for an hour, I took it out of the oven and let it cool for a bit. I then strained the oil into bottles and jars. 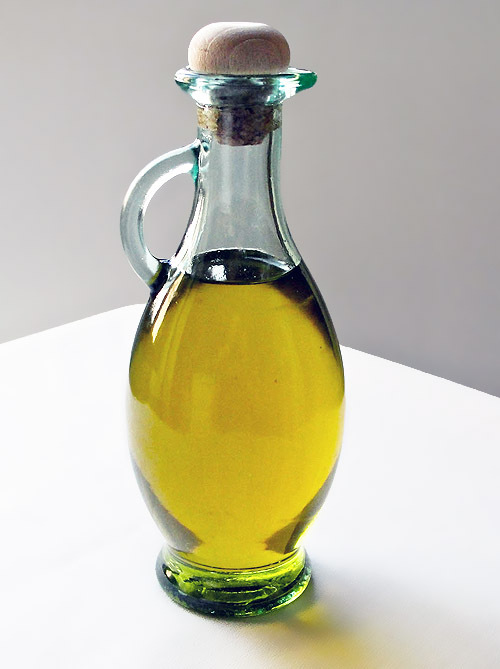 The oil should last a couple months as long as they are stored in air-tight containers and kept in a cool, dark place. Also…after you strain the oil, don’t throw those roasted garlic cloves away! Give them a little squeeze and you’ll have delicious, roasted garlic! 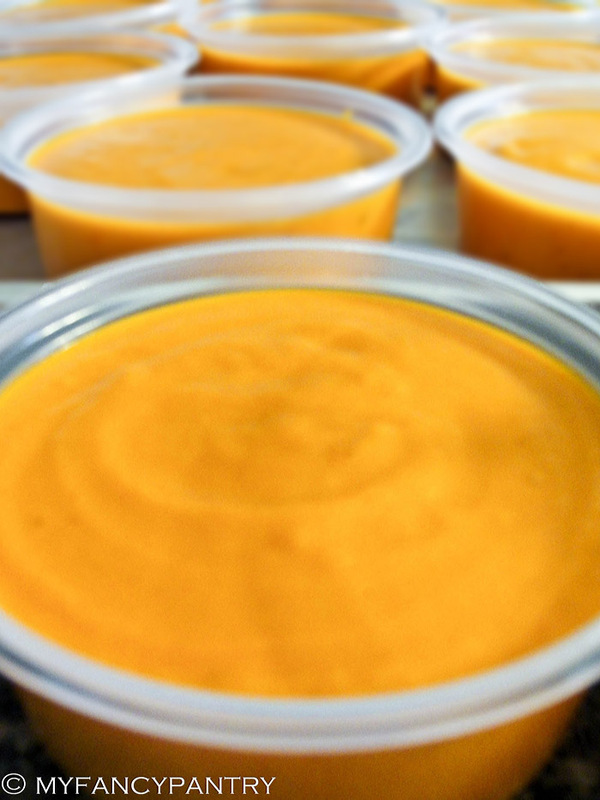 Store this in a container in your refrigerator until you’re ready to use it. …Back to the pizza! After I brushed the dough with olive oil, I cooked the crust for 5 minutes at 450 degrees. I then brushed on a little more oil; and topped the crust with shredded fontina cheese, very thin slices of purple potatoes (which I cooked in a tiny bit of oil for about a minute), pistachios and caramelized onions–cooked with a little ground clove, cardamom, cinnamon, garam masala and tumeric. I tossed the pizza back in the oven (still heated to 450 degrees F) and let it cook for 15 more minutes. Once the crust started to brown, I took the pizza out and drizzled it with a little bit of pistachio honey. I had gotten the honey from a local shop–in a 3 dollar grab bag. It tastes good, yes…but I think you could easily substitute regular honey with a little powdered pistachio mixed in. I also chopped up a bit of cilantro…and dinner was done! The little purple potatoes look like purple pepperonis!!! I also replenished my curry base stock. All Blue Fingerling Potatoes …set out for chitting (sprouting). I also planted another gold colored fingerling, some red potatoes and some yukon golds. And started a new project. This is a cutting board my dad gave me. My grandpa made it when he was a little boy. I’m going to sand it down, oil it up and hang it on one of the walls in my kitchen. I love my grandpa an awful lot (I hope you’re reading this, Old Man! ), and I think this cutting board will be perfect in my house! Saturday was a fun night spent with my husband, sister and niece. We went shopping. We ate Mexican food. 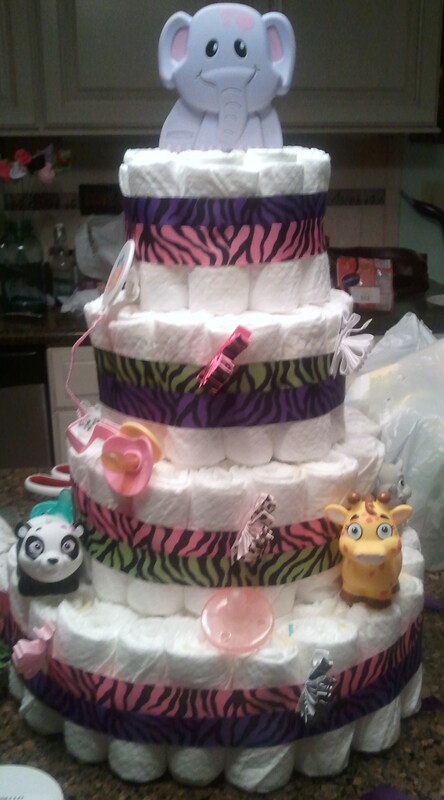 We made a diaper cake (for Summer’s baby shower). Summer—if you’re reading this, you get a sneak peek at the diaper cake for your shower! It’s not done yet, but it’s looking pretty. My niece, Madelyn, turns two next month. She’s a little ball of energy; and as cute as anything! She’s also incredibly hilarious and can make anyone laugh in about two seconds. I swear, that kid can always make me crack up! 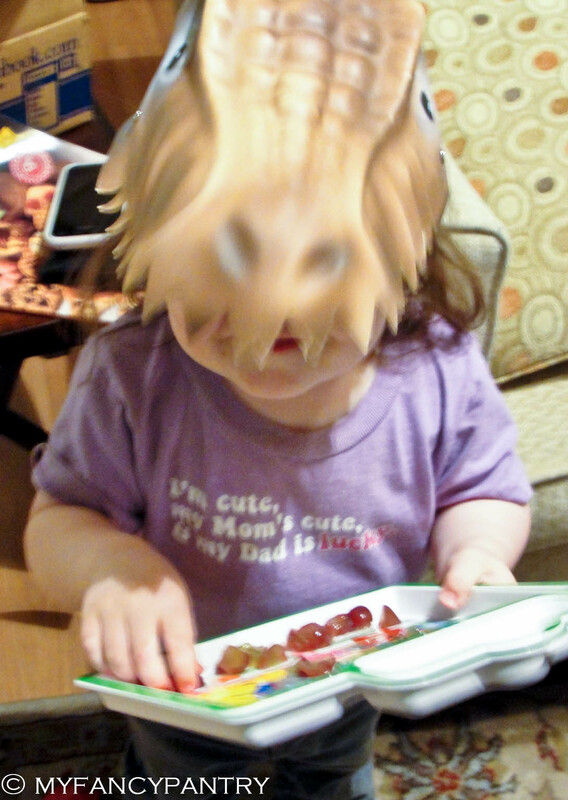 Madelyn also believes she is a dinosaur. Seriously. Its true, I probably do spoil her. I give her tea biscuits and grapes when she comes to visit (ok…sometimes I give her jelly beans). I usually have some sort of toy or trinket for her to take home; and I always have “juice” (water) in fancy Dora cups. But come on! She can say Piyush, but she can’t say Shari? Oh well. Auntie Treat isn’t so bad…right? This entry was posted in Food, Indian, Recipes and tagged Family & Friends, Indian, Pizza, Vegetarian/Vegan on April 24, 2012 by Shari. Wow, this is just out of this world. I am in complete awe. I am such a huge pistachio fan. This is getting made here. Love it. Your niece is adorable. I say spoil her, you can never spend too much time with kids. I wish I could share a slice of this pizza with you through the computer! 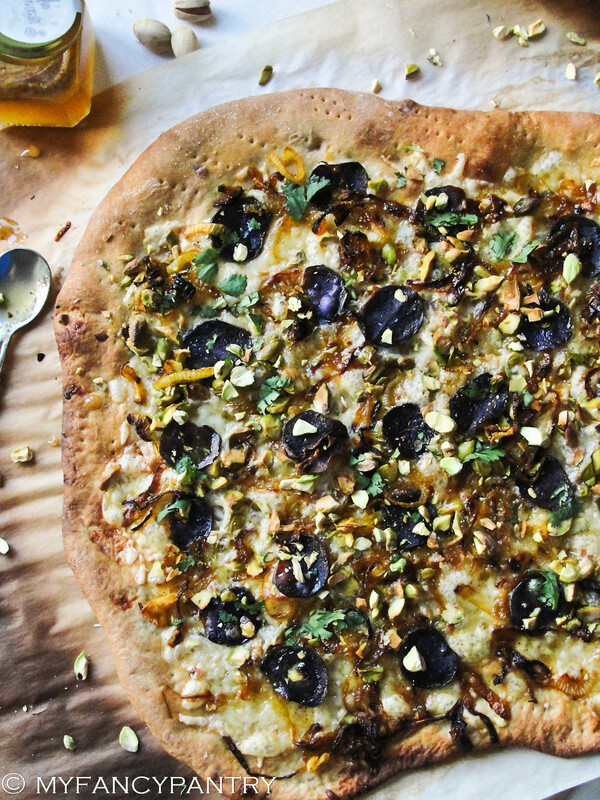 If you love pistachios…you’d love this pizza! *DROOL! * photos look yummy! make more please! I had a pear/gorgonzola pizza that has hazelnuts on it. That sounds so good! …I have an idea for a pizza using pears. I might try it out sometime soon, but first I have to get my husband on board with the idea. He’s not sure he’s willing to try pears on a pizza yet. Gorgeous photos. The pizza looks incredible! I am totally stealing your toppings for our next pizza night. 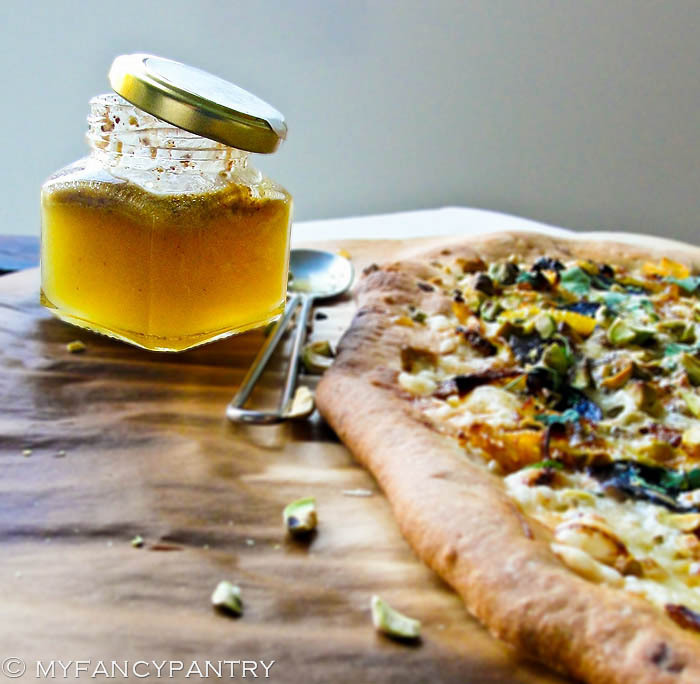 I love goat cheese/walnut/thyme honey pizza, but your combination sounds even better! The Indian spiced onions sound particularly good, and like they’d be useful in all kinds of places. This pizza looks like a work of art! The colors remind me of Carravaggio or Vermeer painting. Thanks for sharing! Bravo! Caramelized onions are great on pizza. I like to do a roasted zucchini veggie pizza. And I throw a head of garlic into the oven while the stone is heating up, then I squeeze it onto the crust before topping it. Thx for sharing! That sounds absolutely delicious! …I used the roasted garlic a few days later and made a simple mozzarella, basil and tomato sauce pizza. It was divine! This pizza…It’s no wonder it was featured on food buzz! On my blog, I feature vegan versions of my favorite recipes. Do you think this could be easily adapted or would I sacrifice a lot of the essential flavors? As for making the pizza vegan, I don’t think it is impossible. I would replace the honey with agave—even crush up some little pistachio nuts and mix them together. Heat the mixture up slightly so it’s easier to drizzle. The Cheese is the only real problem. I haven’t found a vegan cheese I’ve liked; and I’ve tried a lot! I’m actually allergic to dairy and break out in hives when I have too much (you wouldn’t know it from the blog, but it’s true! )–because I haven’t found any good substitutes for foods I love…I usually suffer though. I would say skip the cheese altogether and increase the amount of caramelized onions. Adding more onions will help keep the pizza from becoming too dry. I hope that works for you!!! If you have any questions, let me know! Thank you for all the advice! I know of a few homemade vegan cheese recipes and I’d like to try them out this weekend. Maybe I’ll make a bunch of little pizzas to taste test…I will certainly let you know if I have any questions. What a creative combination of flavors. Sounds delicious! Wow! This is really just stunning. I love everything about it, including the lovely photos. With pizzas sporting unusual toppings. AWESOME! this pizza looks so pretty and yummy! Your post is really nice and the images are great… as an Italian pizza eater I wonder if this would be appreciated in Italy’s pizzerias… 🙂 anyway I am sure that your recipe is worth to be tasted 😉 best greetings from Rome. Very awesome! When you adapt it, I’d love to know how it turns out! …I’ve never experimented with gluten free crusts…yet. Okay, I’m getting in line to get some of this! Just had some pizza, but yours looks tasty, and more exotic lol. Sounds and looks delicious! 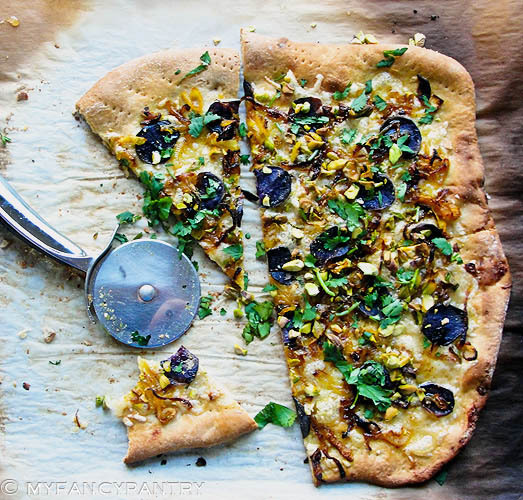 I would have never thought to put purple potatoes or pistachios on a pizza. Thanks and congrats on being posted! So good! I need to make how to learn home made pizza! Yum! Pizza night happened every week when I was living with my sister… I might be starting that up this May! That is an excellent combination for a pizza – the likes of which I have never before encountered. But I will in the future – because I’m going to use your receipe. wow does that sound delicious. I too am a thin and crispy pizza chef, we make our dough and freeze it until needed on friday or saturday nights, varies by time of year. I enjoy the challenge of making veggie pizza’s with in season ingriedients, easy in August, not so much in January. This week will be a asparagus & garlic white pizza with a little bit of home made garlic sauce. I also freeze my pizza crust, it tastes so much better than buying pre-made stuff…and it’s nearly as easy! I will have to try your dough, sounds good. when you get your cutting board back in shape use mineral oil. Food based oils will go rancid, mineral won’t and it keeps the wood looking good and the bad stuff from soaking in. Very cool and very inspiring! As a recent vegan I found this post interesting as I said in my last post, the thing I miss most is PIZZA! I wonder how your pizza would taste without the cheese. Great ideas. I’m not sure…but I think if you increase the caramelized onions…you might not even miss the cheese! Maybe use the roasted garlic (from making the chile-garlic oil), and spread that on the crust first. Thanks Judy! I hope you do use the recipes…and enjoy the onions. The sweetness of caramelized onions pairs so well with the slight kick of the Indian spices! very fancy indeed! I love caramelized onions on just about anything. Cool, unique food idea! that’s an awesome compliment! Thank you! Dont you love caramelized onions? They make everything taste so much better. I absolutely love the combination of flavours you’ve used here, sounds brilliantly gourmet, and I love pizzas that don’t need cheese – so much better than using substitutes (I’m vegan so many vegan pizzas ask for fake cheeses – ew). Beautiful photography too! Yes, I’ve tried the fake cheese…they are pretty terrible! I think it’s creepy that they don’t melt! I don’t know which is better, the amazing pictures or that delicious looking pizza. Either way, I’m going to have to keep stopping by to learn more of these amazing meals you concoct on such a frequent basis. By the way, I have never seen a potato look like that! Where can I find those? 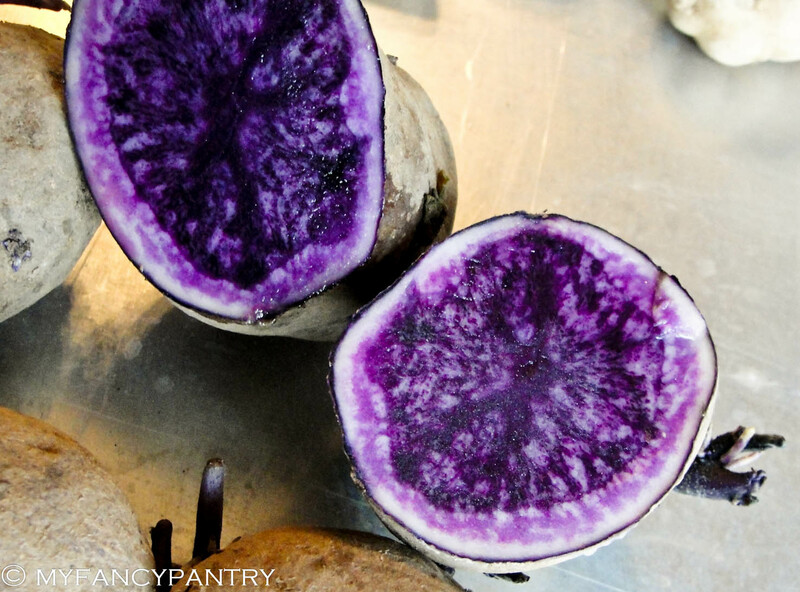 Purple potatoes are also known as Puruvian potatoes…and they’re amazing! They actually taste quite similar to a yukon gold (in my opinion), but the color is so vibrant! I purchased mine at my local grocery store…I’m not sure if they’re available year-round. They’re a little on the pricey side (for the amount of potatoes you get. I think my bag was 2 lbs, and it cost 5 dollars). You can definitely find seed potatoes online and plant your own! …I’m giving it a shot this year and have 4 different varieties planted in 5 gallon buckets. I’ve made pizzas with potatoes, feta and rosemary before – but your pistachio riff is brilliant! I’m making this soon. Please visit my world/blog. D.
wouldn’t that be nice? My hubby and I went to a pizza place yesterday…it was a huge disappointment compared to what I make at home! Shari- I gave up eating out years ago, as I find food overpriced and over rated. Best food is at home! Wow, this looks delicious! Just came across your blog and I’m glad I did:) I’ll definitely be trying this one out, thanks! Looks incredible! Thank you for sharing!! Sounds delicious! 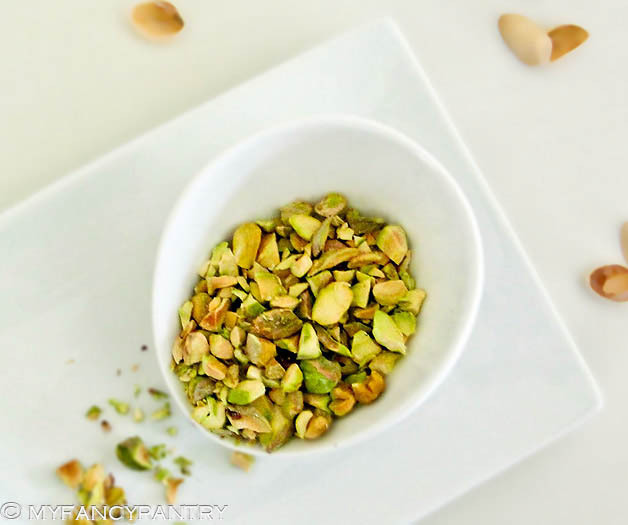 I am hungry, love pistachios and wish you were here to make some for us. haha! well…I wish I could make it for you too! We have home made pizzas most Fridays as well, and have discovered that less is definitely more with the toppings. Pistachio and purple potato are a great idea for toppings – might try that this weekend! I can’t wait to try it and report back on the delicious findings! Shari, you are my pantry hero!!! I loved your diaper “cake” great baby shower idea! This is definitely something new to me, and I find it very interesting. I love pizza to bits, so I’m sure I will enjoy this. Maybe I’ll skip the pistachio part though as I’m not a fan of it, but I’m sure the pizza will still be equally good? I think the pizza would still be good without the pistachios. Maybe add almonds or cashew nuts? I like the extra crunch…but you can definitely leave the nuts off. This looks ridiculously fabulous! I would never have thought to combine these ingredients, but it makes for a stunning pizza! Plus, I love the idea of Friday night pizza nights! Homemade no less! I moseyed over here from Freshly Pressed, congratulations! What a luscious mix of flavors. omgosh that is just plan wonderful. I love the imagery… delectible!! Such a creative idea! thanks for sharing the method .. i will try later..
What a unique and beautiful pizza! I would never have thought to add pistachios or potato onto a pizza but when you see it like that it all makes sense. gorgeous photos too so vibrant! Cograts making freshly pressed. I dont think I could eat this I like the same old pizza over and over canadian bacon and pinnaple. Muy buena pinta…rico y sabroso. So funny- I’ll be posting tomorrow about my pizza with caramelized onions, too. I love the addition of the purple potatoes though! Really makes for a gorgeous pie! The picture of the potatoes is great. wow. that look absolutely delicious. i would never have thought to put pistachios on a pizza! This recipe looks divine! 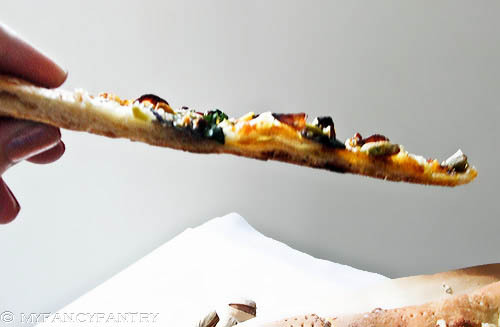 My favorite picture is the slice “floating” above the rest of the pizza. That’s pure genius and I hope you don’t mind that I’m going to steal that idea when taking food pics! Cannot wait to try the recipe out and share it with my family. We need to reduce our meat consumption and increase veggies! ^_^ Congrats on being FP! Gorgeous shots. I love food photos. I’m hungry now! I’m in awe! This sounds so good, I think I’ll actually try it! 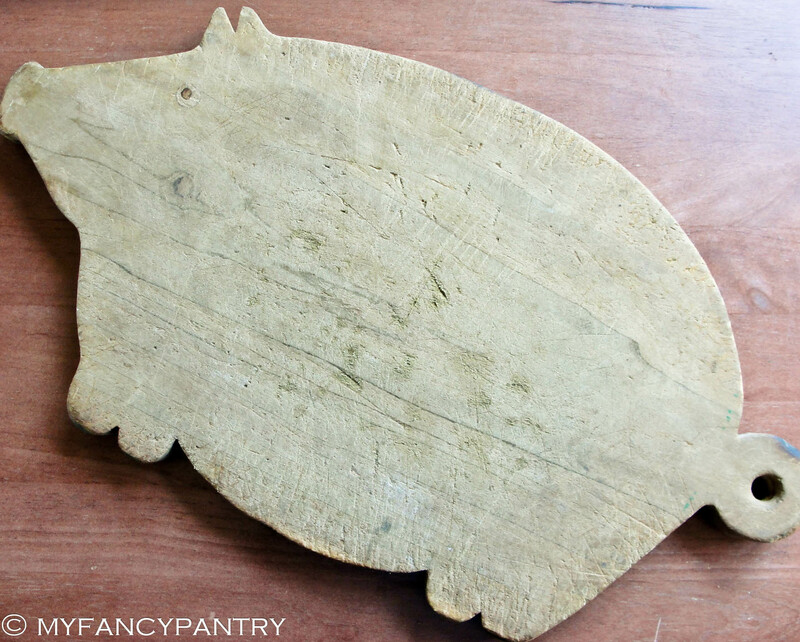 Oh & I love the cutting board…too cute!!! try my version…I think the secret to a crispy thin crust is to pre-bake the crust for about 5 minutes—high temperature–on a pizza stone. It is nice to keep our childhood memories. Like keeping the cutting board from grandba. Thank u for sharing bizza recipe with us. It is so nice to keep our childhood memories.Like keeping the cutting board that was gift from grandpa. Sounds amazing. I am in love with caramelized onions on my pizza in place of pizza sauce or cheese. Can’t wait to try out something similar to your pizza. The last pizza I made with caramelized onions I added pine nuts which was fun. But I never would have thought of adding potatoes! pine nuts would be interesting, too! yum! Wow! Thanks for the inspiration! Pizza is also tradition in our house on Friday. i have not made my own pizza base yet, but I have bought 00-flour and will be giving it a bash soon. Keep up the good work on your blog….. 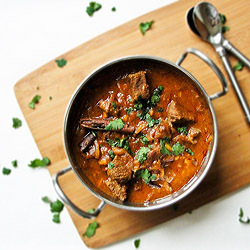 Cannot wait for that lamb curry recipe, sounds delish. Sadly, I don’t know if I can follow your blog, you are making me far to hungry! I’ve been scouring the net for blog-based recipes and I’m bookmarking this one 🙂 Food looks good. Thank goodness atta flour is widely available in our area — so excited to try! We have blue potatoes–for the first time–and now I know what dinner is going to be tonight! Thank you so much. Dude! I HAVE to try making this~! It looks delish! The pizza looks so delicious!!!! Love adding the purple potatoes! Color and flavor in one dash! GREAT recipe! Oh my this is impressive! I think you need a TV show! I love pistachios, so I’m very excited to try this. I’ve been wanting to try purple potatoes. I just couldn’t find a good enough (vegetarian) recipe for me to do so. Thanks!! Congratulations on being freshly pressed. Wildly creative and delicious looking pizza! i love the simplistic beauty of your blog ! How did you dream up this combination it looks incredible! I can’t tell you how incredible this is, so inspiring! Congratulations on being Freshly Pressed! YaY for the planting of the ‘taters…just got ours in also. Looks like a tasty treat you cooked up there 🙂 Caramelized onions with just about anything are right up my alley. Thanks. is that a lizard hat!!!!>??? Love the purple potatoes! 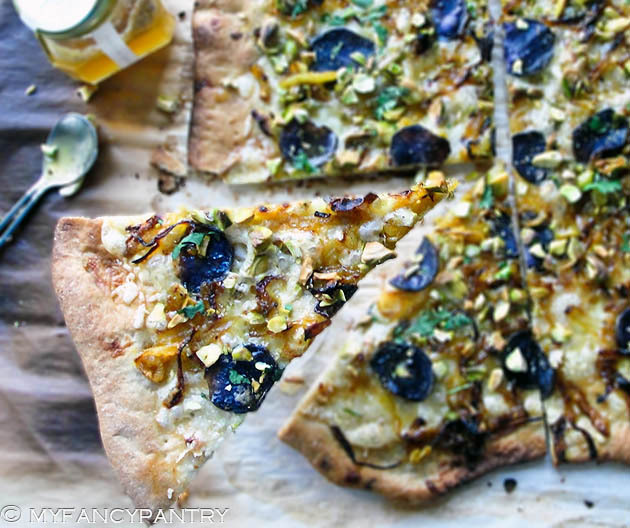 And the idea of adding pistachios to pizza…awesome.